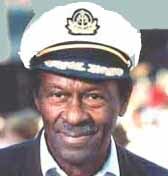 This page was first posted to www.1960sailors.net in tribute to the now late Chuck Berry when he was honored by the Kennedy Center for the Performing Arts in 2000. Now, it's time to take another look at it. On March 18th, 2017, Chuck Berry, the musician so many rightfully called the "father of rock 'n' roll" — died at the age of 90. 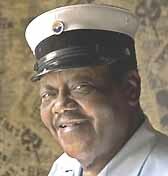 Click here for the 2018 Grammys' memorial tribute to Fats Domino and Chuck Berry. Following this tribute performance, tLos Angeles Times reporter, Randy Lewis, wrote of "the colossal genius of Berry’s music... [and his] astounding gift for wordplay and creative rhyming." 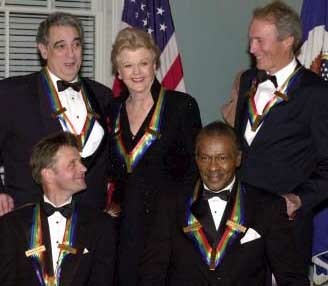 WASHINGTON, DC, DECEMBER 27, 2000: Tonight, the nation watched as CBS broadcast the 23rd annual Kennedy Center Honors, considered by most to be the highest form of recognition bestowed by our nation on a performer. Among the five recipients of the coveted tribute for the year 2000 was our generation's very own Chuck Berry (Click here for video — Berry tribute starts at 4:00 on the footage meter). "With the selection of Berry, 73, the center is at last firmly acknowledging the artistry of rock-and-roll and its enormous impact since the 1950s." hungry teens a language of our own and the music to fire a revolution." Goldie Hawn introduced Berry. She said she had grown up listening to classical music and promised her father that it would always be her favorite music — that she would never like rock 'n' roll. Then, she said, she turned 13 (in 1958) — and things started happening to her. Hawn said that Berry had “reached out to a generation” and, together with Elvis Presley, inspired her to pursue her dream. She called him the "poet laureate of rock 'n' roll" and then, Hawn got a broad smile and a thumbs up from the ever cool Mr. Berry when she told him that no one ever said it better than he did when he sang, "Roll over, Beethoven, and tell Tchaikovsky the news." Everyone knows Chuck Berry "could play a guitar just like a-ringin' a bell." And everyone knows he is generally regarded as both the greatest guitarist and the greatest lyricist of rock 'n' roll's pioneer generation and was the first in a long line of rock 'n' roll singer-songwriters and one of the best of all times. Quite appropriately among the very first round of inductees in 1986 into the Rock and Roll Hall of Fame, his influence on others that followed is widely acknowledged and undeniable. "Berry, 74, was cited for his role in helping to create the hard-charging rock 'n' roll sound that has dominated popular music for five decades." "But perhaps the most far-reaching toast of the evening [which was unfortunately edited out of the television broadcast] came from composer Marvin Hamlisch, who toasted Berry as the 'one figure who, as much as anyone, can lay claim to the invention of rock-and-roll. As a boy in New York,' he said, 'I was taught the music of the three B's — Bach, Beethoven and Brahms. But as a teenager, I lived with the fourth B — Chuck Berry.' Noting Berry's early fusion of country and western guitar riffs with jazz and rhythm and blues, Hamlisch said, as an American, 'I'm as proud of Chuck Berry as I am of George Gershwin and Leonard Bernstein.' At the end of the Berry tribute, Little Richard and an all-star ensemble paid musical homage to Chuck Berry … [and] brought the whole hall to their feet, including the president [Clinton]." As the audience filed out, you could almost hear the mental loop playing in everyone's heads: "Roll over, Beethoven, and tell Tchaikovsky the news." Chuck, in 1957, you said, "Maybe someday, your name will be in lights." But did you ever dream of anything like this? "He's the king of rock 'n' roll. ...Chuck Berry is the greatest. He's the Hank Williams of rock 'n' roll." "Of all the early breakthrough rock & roll artists, none is more important to the development of the music than Chuck Berry. He is its greatest songwriter, the main shaper of its instrumental voice, one of its greatest guitarists, and one of its greatest performers. Quite simply, without him there would be no Beatles, Rolling Stones, Beach Boys, Bob Dylan, nor a myriad others. There would be no standard "Chuck Berry guitar intro," the instrument's clarion call to get the joint rockin' in any setting. The clippety-clop rhythms of rockabilly would not have been mainstreamed into the now standard 4/4 rock & roll beat. There would be no obsessive wordplay by modern-day tunesmiths; in fact, the whole history (and artistic level) of rock & roll songwriting would have been much poorer without him. Like Brian Wilson said, he wrote "all of the great songs and came up with all the rock & roll beats." Those who do not claim him as a seminal influence or profess a liking for his music and showmanship show their ignorance of rock's development as well as his place as the music's first great creator. Elvis may have fueled rock & roll's imagery, but Chuck Berry was its heartbeat and original mindset. " The Class of 1960 offers its sincere thanks to you, Chuck Berry. We are deeply grateful to you for helping to make our teenage years so very special ― and for entertaining us and keeping us rocking ― yes, and keeping us young ― since 1955! On October 18, 2016, Chuck Berry turned 90 years of age!! He brought us all so much joy, and now he is gone. But he left so much for us to treasure and remember him by. Chuck, you were the man ¾ the undisputed grand old man of rock 'n' roll!! 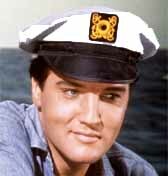 Did you know Chuck, Fats and Elvis were all honorary Sailors? Copyright © 2000, 2007, 2011, 2016-2018 by Howard B. Levy and 1960 Sailors Association Inc. All rights reserved.